Which mantra we should recite before doing Kumkuma Archana? We should offer our prayers to Lord Ganapathi through reciting Ganapathi ashtothram and then do Kumkuma archana to goddess lakshmi. In which Kala we should recite Durga Mantras like Durga Saptashati, Durga Ashtothram? 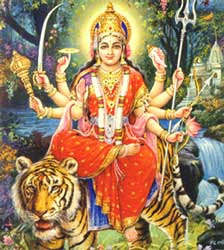 We should recite Durga Mantras in Rahu Kaala or Rahu Kalam. How to perform Dik Namaskar i.e Namaskara in all directions? First start your Namaskara in east direction (Purva in Kannada ; Kilakku in Tamil), after east turn in clockwise direction and offer your namakara in South Direction (Dakshina in Kannada ; Therku in Tamil) then in West (Paschima in Kannada ; Merku in Tamil), then in North (Uttara in Kannada ; Vadakku in Tamil) and finally again in east. After this offer your namaskar to NE (North East) ; SE (South East) ; SW (South West) and in NW (North West) direction. After this, offer your namaskar to above and below i.e sky and earth. In which colour should we put Waistband? We should put Waistband (Hurudhara in Kannada ; AranaKayiru in Tamil) in Black Colour. Don't use red colour. If you are capable you can put it in silver. As soon as a baby is just a few months old, a circlet of silver is fastened on its waist. It is mostly a festive affair, the costs of which is borne by the baby's maternal grand parents. The silver circlet is substituted by a thick, black thread which boys wear throughout their lives while girls remove it on attaining puberty. It should be minimum of two rotations or circles.